Congratulations! You're engaged! Now the real drama of planning the wedding begins. Or not. It's really up to you. If you want the ultimate low-stress guide on how to start wedding planning, then read on! Weddings can get as big, bad and stressful as you'll let them get. So take control early by defining your limits, booking the right venue early, and getting the expert advice you need. You'll only do this once in your life, so the smartest thing you can do is rely on the advice of professionals who plan and host weddings every other weekend! Some people thrive on stress and get off on the nervous energy of planning a wedding in the most convoluted way possible. If you're like the rest of us, you'd rather a relaxed stress free planning affair. If you're up for some tips on keeping your wedding stunning, but stress-free, we've got you covered. Plan to plan? Yes. There are so many details to plan, that a wedding can get totally overwhelming. So what you want to do, is break it down into manageable parts. Excel is your friend here. 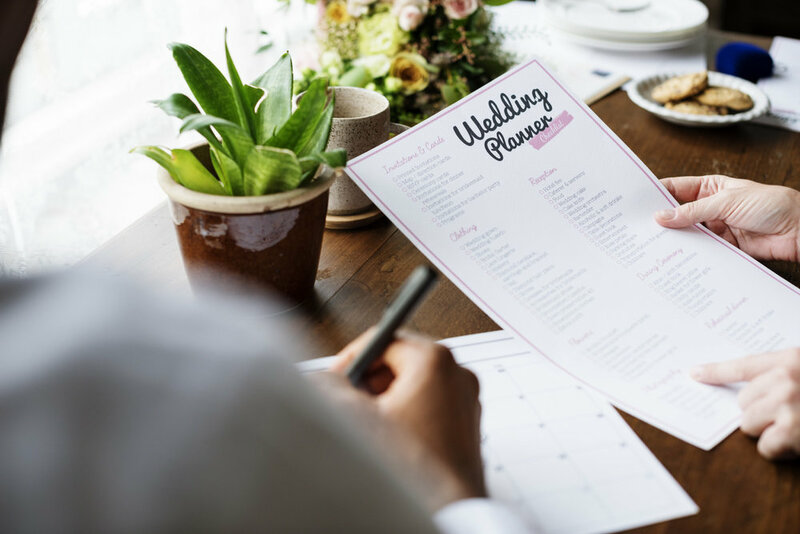 Work out at what point you need to plan each aspect of the wedding, and schedule it in the calendar. That way, you plan each detail at the adequate moment, and can avoid developing a nervous tic for the next few months! Wherever possible, outsource to friends and professionals to help the planning go more smoothly. This is one of those moments in life where you need to accept you cannot do it all. A wedding is a family celebration. It's a rite of passage, and a way to firm up the support network that holds this couple up. A beautiful way to reflect that in the wedding is to involve friends and family in the design. If your cousin is a great photographer, and your soon-to-be sister-in-law has a stunning voice, bring their skillsets to the wedding! Ask great-aunt Martha to help with the tables, and your best friend to lead the dancing. This isn't so much about saving money - though it'll help, as it is about making the event a real inclusive affair. It probably goes without saying, but it's worth being clear on this detail. Only ask reliable, stress-free family and friends to fill these important roles. If Uncle Frank sometimes shows up and often doesn't, don't give him a job. There is a classic dilemma the week leading up the wedding. Friends and family from all around land at the venue location. The one thing they all have in common is you. So if they want advice on where to eat, where to fix their broken high-heel or where to get a last minute haircut, they call you. This final week also happens to be the most stressful of the whole planning process. So, early on, elect a practical, problem-solver friend or relative to be the 'fixer', and redirect any issues people have to them instead. A good wedding planner is worth their weight in gold. You can send them your Pinterest boards or scrapbook for the sorts of wedding theme you want, and they'll jump in with suggestions and advice. If they've been in the game for a while, they'll score you discounts and hook you up with the real professionals. A wedding planner will know who does the most stylish makeup, hair and the best wedding banquet in town. Wedding planners will often offer several different packages with ranges of support and responsibility for the event. If you know people who've recently married in the area you might hit them up for some wedding planner recommendations. To stay stress-free, get the basics organized early. It's hard to invite guests when you haven't locked in the venue yet. For the reception, look for a wedding banquet with a lot of experience and lots of different options so you can make your wedding truly unique and memorable. At Avanté Banquets, we offer exquisitely landscaped grounds and a distinctive style that your guests will just love. We like to say that it's your day, so we do it your way. Which brings us to the next point. With budgets, timelines, RSVPs and your gown and styling, it's easy to get caught up in the stress of wedding planning. Friends or relatives might try to persuade you to do things the way they want them. You love them, you want to please them, and sometimes it feels like the easiest thing to do is to cave in. Don't give in, because you'll regret it. This is your special day, and it's about celebrating that the two of you found each other. Celebrating that you're about to embark on a long and happy marriage. If you've locked in a great venue early and involved a professional wedding planner, you can scale down the stress a bit. Some brides even tell us having a calming mantra can help! Find a phrase that reminds you this will be a special day, that things will work out just fine. When you're feeling overwhelmed take a moment to repeat it silently in your head. And breathe! There you have it: how to start wedding planning without the stress. Ask for help, outsource, and plan the planning early. If you've got helpful, responsible loved ones, give them planning jobs, and make use of their skillset! The best bit about stress-free wedding planning is it keeps you focused on what's important. The marriage you're about to begin. With the love of your life. Stay focused on the romance and the joy, and do your best to leave the stress behind you. One of our stress-free planning tips is to get the venue sorted early on. If you're ready to book the perfect wedding reception venue, get in touch with us at Avanté Banquets today!